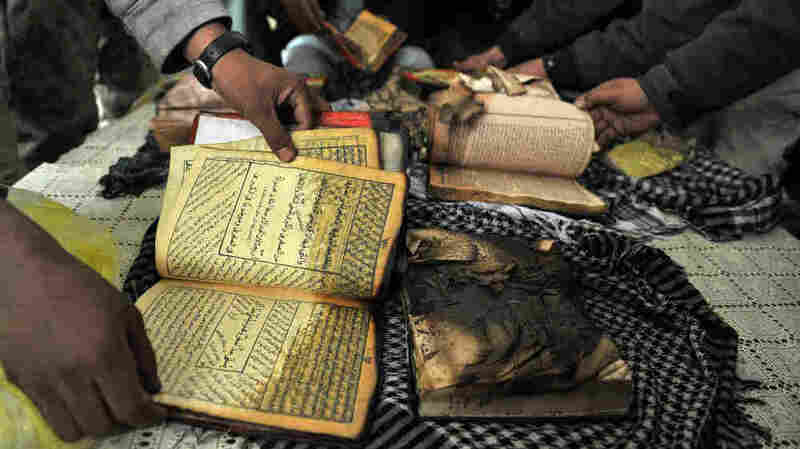 How To Properly Dispose Of Sacred Texts The burning of Qurans by the U.S. military in Afghanistan has led to days of rioting by Muslims who say it was a desecration of their holy book and an affront to Islam. Many faiths prescribe specific rituals for disposing of their sacred texts. On Feb. 21 outside Bagram Airfield, Afghan demonstrators show copies of Qurans allegedly set on fire by U.S. soldiers at a NATO airbase outside Kabul. The Quran is considered to be the speech of God to humankind — word for word — explains Imam Johari Abdul-Malik. "The traditional way of disposing of used or damaged copies of the text of the Quran is by burning it," he says. But Malik, the director of outreach for the Dar al-Hijrah Islamic Center in Falls Church, Va., says that doesn't include burning it with the trash. That's what U.S. officials say mistakenly happened with the Qurans in Afghanistan. The burning of Qurans at a NATO airbase near Kabul led to days of rioting by Muslims who say it was a desecration of their holy book and an affront to Islam. President Obama has since apologized for the incident. Islam certainly isn't the only religion that has rules about how to handle its sacred text. Many faiths prescribe specific rituals for disposing of them, and the bottom line is respect for the words on the page. Malik, who spent time in Afghanistan in November 2010, says the troops should have asked for guidance. "If one said, 'Well, we're burning some Qurans today,' that wouldn't incite riots in Afghanistan," he says. "The problem is when one puts a malicious intent as part of the burning." Malik says the assumption there is that Americans disrespect Muslims. That's why there would be such a visceral response to burning the Quran, even though a layperson could do so under Muslim law — as long as the intent was respectful. The Quran may also be buried. It should be wrapped in something pure and buried in a place where people do not walk. Many of the religious leaders who spoke to NPR agreed that burial was the most respectful way to dispose of their sacred text. In the Greek Orthodox Church, Bishop Andonios says, either a layperson or clergyman could put the Holy Scripture to rest. "The appropriate way — if it was necessary to dispose of that item that had been torn or water-aged — would be to bury it or burn it," he says. The bishop, who is chancellor of the Greek Orthodox Archdiocese of America, says no specific ceremony is involved. "In the case of most laypeople, they would bring it to the church and let the parish priest dispose of it," he says. Rabbi Menachem Genack of the Orthodox Union says "the Torah is handled with an enormous amount of respect." Generally, he says, the sacred texts are buried. Genack is the rabbinic administrator and CEO of the OU Kosher Division. He says shaimos — documents containing the name of God in Hebrew — are treated in a similar manner. "You can't just burn them or throw them in the garbage," he says. "So either they are buried as the Torah would be, or they're put away." The Evangelical Lutheran Church in America doesn't have an official policy for the disposal of Bibles. However, "for some it would be burying, which would be a sacred thing to do just as you would bury a loved one," says the Rev. Donald McCoid, an assistant in the office of the presiding bishop. The Rev. Monsignor Kevin Irwin, a professor at the Catholic University of America in Washington, D.C., says the Bible "should never be not seen to be revered, or valued and treasured." Irwin says he also prefers disposal by burial "because it is so sacred, and you don't want it to be perceived to be disgraced even by burning." The sense of the sacred is also paramount at the Baha'i National Center in Evanston, Ill.
"We feel that Baha'u'llah was a divine figure," says Thomas Murphy, who works in the office of the secretary at the center. Murphy says the Baha'i faith is centered around a figure equal in stature to Jesus or Muhammad or Krishna, and his words are to be treated with respect. "There are no ceremonies attached to the treatment of books containing the sacred word," he says. Murphy says the disposal of books containing their sacred texts must be done with a sense of dignity and reverence.